One of the great things about being a social enterprise is that Stitch is fortunate to have thousands of members who believe in what we are doing, and who make enormous contributions to the Stitch Community to help enrich the lives of their fellow members. This is what makes the community work for everyone, and gives real meaning to our saying "built by members, for members". Because of this, we have been working on ways to recognize the contributions that Stitch members make to the community, provide easier ways for all members to get involved, and provide benefits and rewards to everyone who helps the community grow. All of this has led to the creation of the Stitch Rewards Program. The basic idea of the program is simple: positive contributions you make to the community are recognized by rewarding you Membership Points. 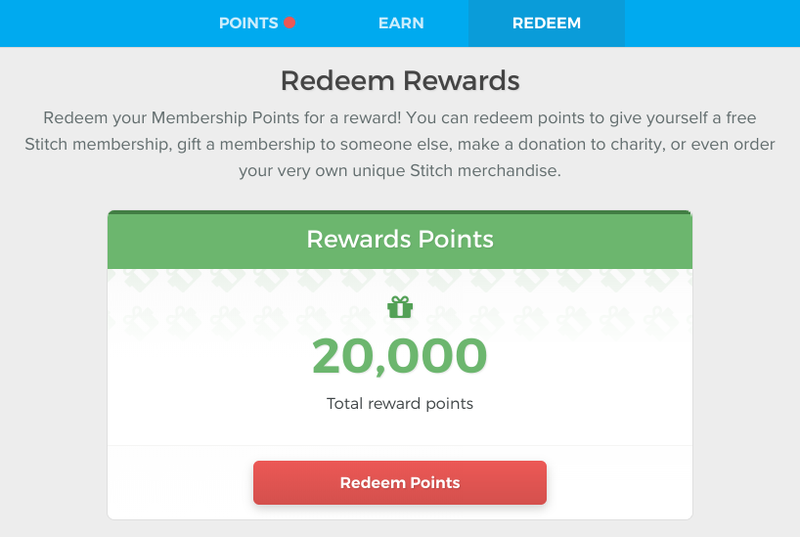 The more points you earn, the more benefits and rewards Stitch you will be eligible for. Your membership Status, which reflects how much you have contributed in a 12 month period. This is a bit like the concept of a frequent flyer status with an airline, with each status level giving you higher privilege levels on Stitch. Your membership Rewards, which track the total number of points you have earned overall, and can be redeemed for real-world gifts and rewards. Let's look at each part of the reward program in turn. By simply paying or renewing your Stitch Membership. These reflect the most significant ways that each Stitch member can help the community, but we'll be adding other ways to earn points in the future. You will now also earn 100 points for every Full member who attends an activity you organize, plus 10 points for each Basic member. The more members who attend your events, the more points you will earn! And if you are organizing your events in an area which doesn't have much community activity yet, you may also earn a bonus 500 points for every event you create. Finally, you earn points every time your membership subscription is renewed. The number of points you earn depends on your membership type: annual members, for example, receive more points than monthly members. At a simple level, the more you contribute to keeping the community running by paying your membership fees, the more points you earn. Every membership point you earn contributes to both your membership Status and your accumulated Reward Points. On Stitch, your Membership Status is based on the number of membership points you earn in a 12 month period. The more points you earn, the higher your status, the more recognition you receive from fellow Stitch members, and the more privileges you get on Stitch. The idea behind the Stitch Membership Status is to recognize members who consistently contribute to the community for the benefit of other members. This shows you your current status, the number of points you've earned since achieving your current status, and how many more points you need to either get to the next status level or retain your current status. If you select the More Details button you'll see a more detailed view of the points you need to reach each level. As soon as you choose one of our membership plans, you earn Bronze status. You are also credited with membership points for paying your membership subscription. From that point, you just need to earn 1,000 points in the next 12 months to retain your Silver status for another year. 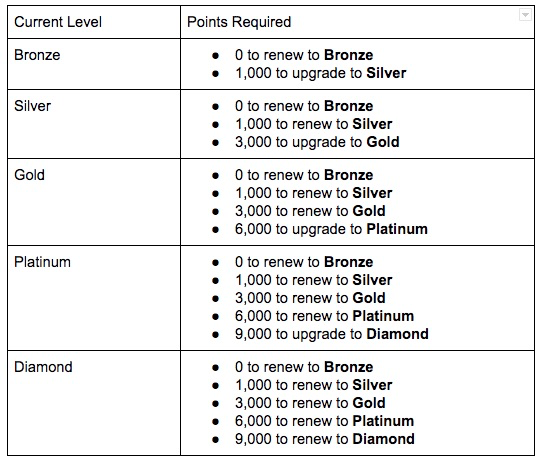 If, during that 12 months, you earn 3,000 points, you will be upgraded to Gold status. Your renewal date resets at that point, giving you another 12 months to earn 3,000 points to retain your Gold status for another year. If, during that 12 months, you earn 6,000 points, you will be upgraded to Platinum status. Your renewal date resets at that point, giving you another 12 months to earn 6,000 points to retain your Platinum status for another year. 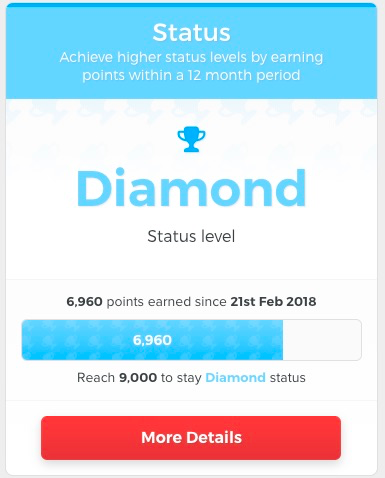 If, during that 12 months, you earn 9,000 points, you will be upgraded to Diamond status. Your renewal date resets at that point, giving you another 12 months to earn 9,000 points to retain your Platinum status for another year. Higher status levels also entitle you to additional privileges, such as extra profile views, the ability to create special event types on Stitch, and more. Stitch status levels are a great way to publicly recognize those members who are most active in helping improve the Stitch Community. But the great news is that even if you don't contribute a lot in any 12 month period, you can still benefit from what you do for the community. Each Membership Point you earn will, in addition to adding to your membership status, add to your total accumulated Reward Points. The good thing about Reward Points is that they never expire, so you don't need to earn them in just a 12 month period. And once you earn enough points, you can redeem them for real-world gifts and rewards! 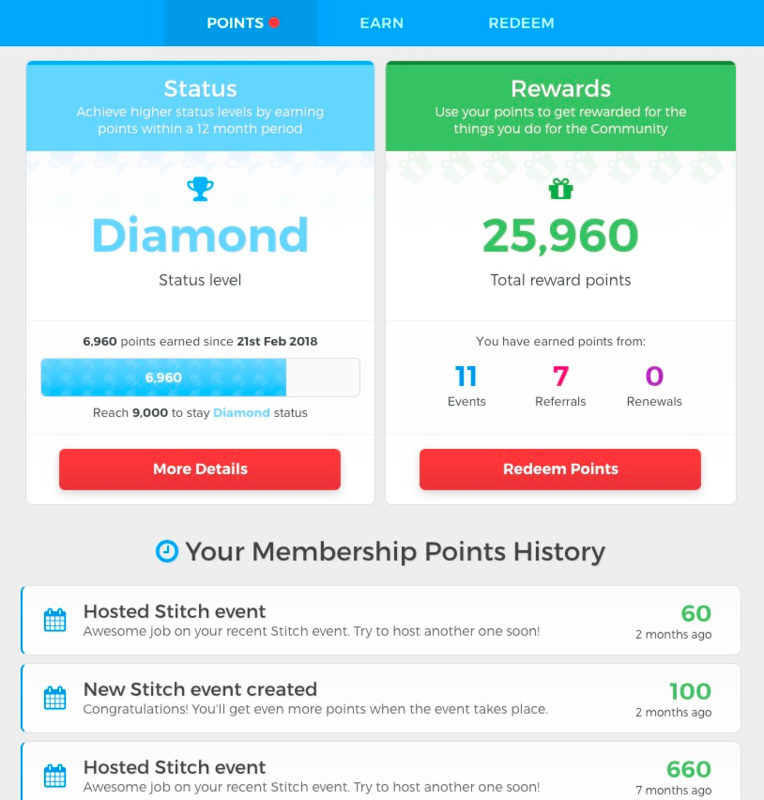 This shows you a snapshot of how many points you've earned over the lifetime of your Stitch membership, along with how you earned those points. We will be adding additional redemption options at lower point levels in the future. One thing to note about Reward Points is that they can't be redeemed until 3 months after they were earned. This is to prevent the rewards system from being abused. 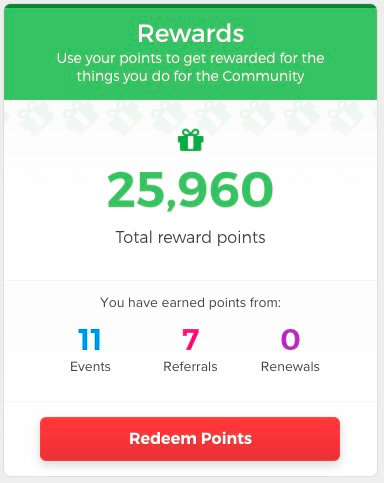 Points which have been earned but which are not redeemable yet are shown under Pending Rewards Points at the bottom of the page. For further details about Stitch Rewards and what you are entitled to, contact us. You get to keep your Reward Points as long as you retain a membership subscription to Stitch, whether that is a Full Membership, Community Membership, or Limited (Monthly) Membership. If you cancel your subscription, your points will be lost. If you choose to rejoin within 30 days, however, your points will be reinstated. That means if your credit card expires and you forget to update your credit card information - resulting in your account being suspended - you can still recover your points by updating your payment information within 30 days. After that point, your points will be permanently lost. Can I earn points by contributing to the forums? At this point no, you don't earn points by participating in the forums. That's something we would like to add eventually, but there are a number of safeguards we would need to put in place to prevent the system from being abused, so it will come at a later point. Will this "cheapen" the spirit of altruism on Stitch? This is certainly one of the concerns we had about putting any recognition system in place, and has been a factor in how we've designed the points system. We don't believe that most members will do things simply to earn points, so this won't replace the spirit that our members already show by helping contribute to the community. What the program will do, however, is help provide recognition for those members who do the most for the community, as well as raising awareness of the most important ways that existing members can help make the community better. The entire program is very much a work in progress, so if you've got any feedback or comments, please let us know!